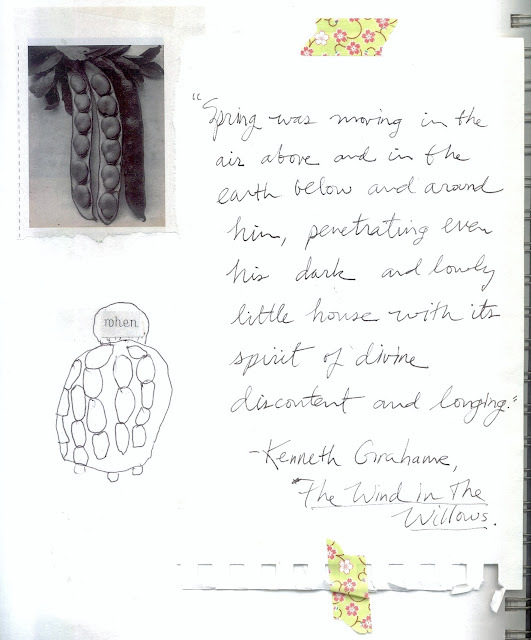 I think, Dear Ones, that The Wind in the Willows might be the perfect book. In what way, you ask? It has poetry, of course, in shovelfuls, and rhyme and song, too; it is a joy to hear and read aloud: it has a non-western philosophical tone, morals based on the nature of growing things, and attention to what Wodehouse's Jeeves would call the psychology of the individual. It speaks of great spiritual questions, and of what it takes to carry on in the face of adversity, or worse yet, ennui. It puts all its faith into relationships; it puts all hardship and sorrows into them, too. It is filled with imagery and description that carry the love of looking, of regarding. It has zany high jinx, swashbuckling adventures, quiet introspection, and mythic mysteries. It's life. If you were reading only one book in a lifetime, this one might suffice. Today, on a Spring morning, I contemplate transcribing each word to better feel each word's perfection, to hear it even more fully. I think; That might be a worthy homage. PS If you can't bear anthropomorphizing (more's the pity), then read Pilgrim at Tinker Creek instead, O callous realist. It is near perfect in similar ways. Wanna fris a little more....? Have it read aloud to you, while you multitask your way through the new millennium.